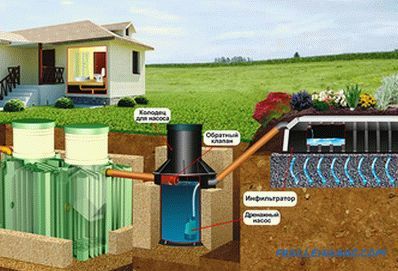 Today we will find out how to choose an autonomous sewage system in a private house and what method of disposal of liquid wastes generated in the process of life activity of its inhabitants is the best. The correct choice of waste disposal system is possible only on the basis of an analysis of the advantages and disadvantages of each of the systems. In the article we will look at each design, the list of components, the principle of operation, features, strengths and weaknesses, and we will also analyze in which case it is advisable to use a particular system. At one time this type of autonomous sewage system was the only one and had no alternative. Device. The cesspools have a simple structure and represent a sealed container dug into the area into which the sewage is discharged to the collector. The pipeline is laid below the level of soil freezing, if for any reason this cannot be done, it is insulated. Each of the above mentioned cesspit structures has its own peculiarities that must be taken into account during their construction. Drive from brick. When building a brick stack, it is allowed to use only ceramic, which is sufficiently resistant to aggressive environmental influences. The optimal form of such a structure is round, when viewed from above, which provides maximum strength. Reinforced concrete rings. They are mounted using heavy construction equipment. The use of well rings significantly increases the structural strength and eliminates the possibility of wall collapse with prolonged exposure to aggressive wastewater. Storage container made of plastic. It has rather thick walls and is made of plastic that is resistant to moisture, acids and alkalis. 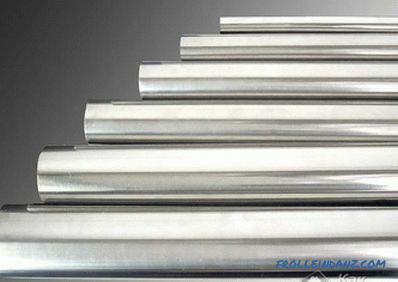 Such a product is of exceptional reliability and durability. The relatively small weight of the drive allows for manual installation with the involvement of several assistants. But in this case it is necessary to spend money on the purchase of the tank itself. On the market there are many manufacturers and manufactured by them modifications of various containers. Monolithic reinforced concrete cesspit. It is cast on the spot into a removable formwork using high-quality cement-sand mixture and steel reinforcement. On the outer surface of the cesspool walls, waterproofing is applied to protect the concrete from destruction under the influence of the external environment. The distance to the water lines is at least 10 m, to the wells - no closer than 20 m, to the borders of the site - more than 1 meter. The maximum depth of the cesspool is 3 m and is determined based on the groundwater level. The distance to residential buildings and outbuildings must be at least 10-12 meters. Close proximity can lead to flushing of foundations. Principle of operation. All sewage flows through the pipes to the tank. As wastewater accumulates, they are pumped out by specialized sewage trucks. The level of liquid waste in the cesspool should not exceed the mark of 0.35 m from ground level. Overflow can lead to runoff from the soil and contamination of the soil and aquifers. The cesspool is cleaned as needed, but at least once every six months. With the same frequency, the disinfection of storage devices is performed using special solutions. Complete tightness of a serviceable drive prevents the possibility of contamination of soil and aquifers. Simplicity and reliability of a structure that can be built on its own without the involvement of specialists. 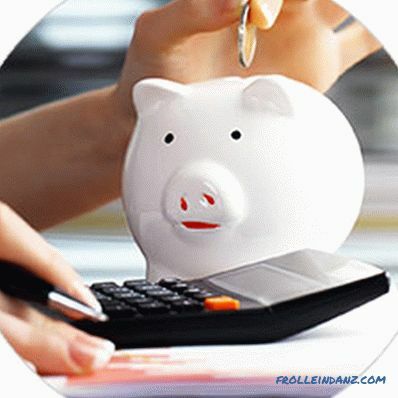 The relatively low cost of purchasing and installing a finished plastic storage device. Need periodic cleaning of accumulators from liquid waste. 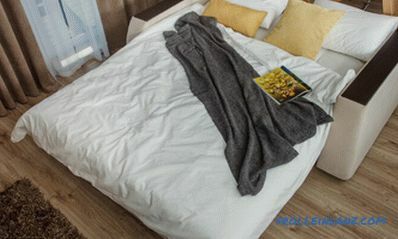 Such facilities will be optimal only in homes designed for the temporary residence of a small number of people. With a volume of waste more than 1 cu. meters per day, even large drives in 6 cu. meters are filled within a week, and their operation is too expensive. Very unpleasant smell when carrying out cleaning works. At the location of the cesspool on the site, it is necessary to take into account not only sanitary standards, but also the possibility of a vehicle approaching for pumping drains. It is impossible to equip with a high level of groundwater. In which case you should use a cesspool. 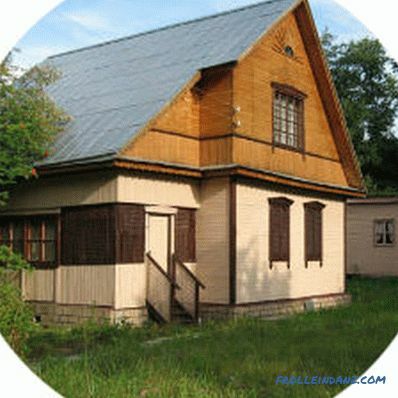 A cesspit of accumulative type is used mainly in private houses in summer cottages that are not intended for permanent residence. It is caused by a limited capacity, which necessitates frequent cleaning using sewage trucks. The cost of work with frequent cleaning can be a significant part of the cost of utilities. It should be borne in mind that in case of high groundwater storage it is necessary to use a plastic container. When using other types it is difficult to achieve complete tightness. which will lead to the filling of the pit with groundwater. The basis of liquid waste is ordinary water, and the task of autonomous sewage is to ensure that it is cleaned to a safe level. Then there is no need to collect and store a large amount of waste. This problem is solved with the help of septic tanks, which are separated from the water mechanical, biological and chemical pollution. The separation of water from solid insoluble impurities occurs by the flow of effluent from one tank to another. At the same time, the water is not completely purified and it needs additional treatment, which is carried out with the help of various filtration systems. 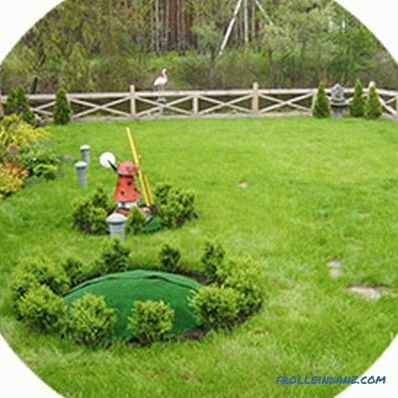 Let us consider in more detail the design and operation of septic tanks with various filtration systems. This will make the choice of the most suitable device for specific conditions, taking into account all factors. Septic tank with a filtration well. 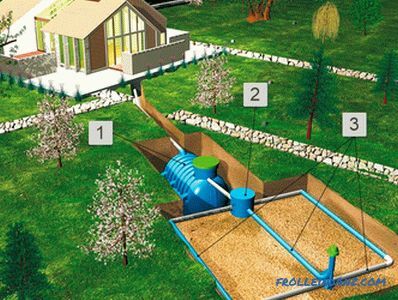 A wastewater treatment plant of this type can be built independently from available materials, and you can purchase ready-made, technically equipped devices for this purpose. Inside the tank there are compartments through which the drains are cleaned of solid impurities. 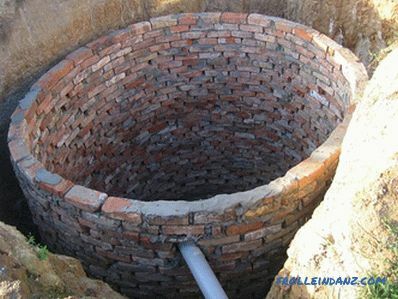 The filtration well is installed in such a way that its lower edge is above the groundwater level. A two-layer cushion consisting of coarse-grained river or quarry sand is poured to the bottom of it, on top of which crushed stone of medium and small fraction is poured. One of the options for the implementation of such waste disposal, is a system of overflow wells. 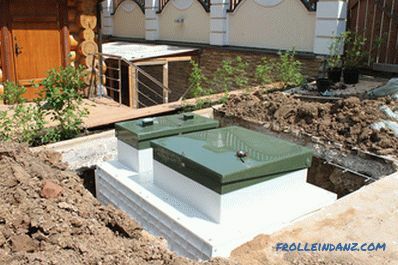 Sewage treatment plants of this type can be built from bricks or concrete rings without the involvement of specialists. This circumstance significantly reduces the cost of their creation and operation. 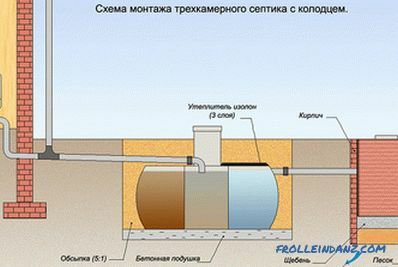 The principle of operation of a septic tank with a filtration well. Waste water enters the pipeline into a sump with a sealed bottom, solid particles settle to the bottom, and insoluble fats float to the surface. In some cases, there may be several such septic tanks, through which the drains are successively passing. Partially clarified water along the connecting manifold embedded into the tank wall at a height of 2/3 from the base, is poured into the filter well. At the bottom of this structure there is a cushion of sand and rubble, through which the moisture leaks. To reduce odors from the sedimentation tank, it is recommended to periodically use supplements containing cultures of anaerobic bacteria. Microorganisms effectively decompose biological waste into relatively safe components. The pillow is silted up gradually and gravel and sand must be replaced with a clean one, after which the well will be able to perform its task again. In this case, the process of silting the well slows down considerably; it is necessary to perform pumping of liquid waste not more often than once every six months. The operation time of the structure until the complete silting of the bottom of the well largely depends on the composition of the soil. Sandy and sandy soils absorb water well and, therefore, have a greater resource, clay and loam practically do not absorb liquids, and the wells are quickly clogged. Replacing the gravel-sand cushion in the filtration well takes place about once every five to six years. 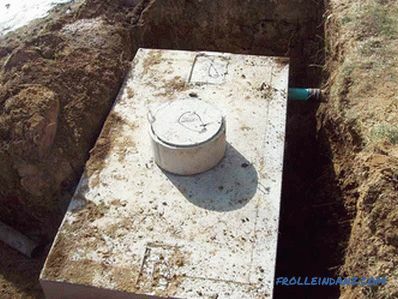 Main advantages a septic tank with a well is simplicity of design. Significant time between the next maintenance operations. Complete non-volatility of the system. Not possible to place at high groundwater levels. Not suitable for clay soils. The level of wastewater treatment is not high. It is necessary to regularly clean the septic tank from sludge, but not as often as from cesspools. After 5-6 years, the gravel-sand pad in the well will have to be changed, the operation is very dirty and labor-intensive. In which case you can use. The performance of such systems strongly depends on the composition of the soil and the groundwater level. 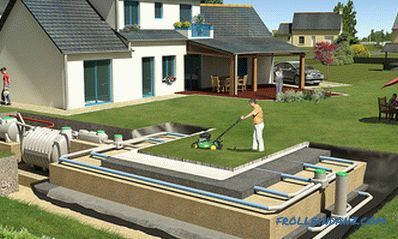 Such wastewater treatment plants are used in homes designed for year-round living of a family of three or four people. The system is unable to cope with a salvo discharge, which can lead to its overflow and leakage of liquid waste to the ground. 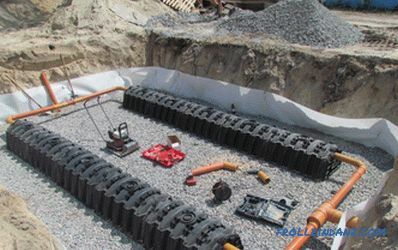 Uninterrupted operation of such a system is guaranteed in the case of its use on sandy and sandy sandy soils, as well as black soil and loam with a predominance of sand, with a low occurrence of groundwater. 1. The sump. 2. Distribution well. 3. Underground filtration fields. They consist of perforated pipelines and gravel-sand cushions located in the ground, which act as filters. The thickness of the filter element is 1 meter or more. 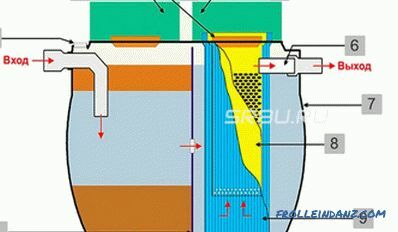 The principle of operation of a septic tank with a filtration field. Drainage from domestic sewage enters a septic tank consisting of two or three chambers. In the first compartment, the waste is settled, and there is a gradual sedimentation and ascent of insoluble contaminants. The clarified water is poured into the following chambers, where it passes the subsequent stages of purification. Next, the water from the sump falls into the distribution well. From the well, water enters the pipes of the filtration field and seeping through the holes in the pipes is almost completely absorbed in the fields. Some systems are equipped with another well, which is installed behind the filtration field, as well as a drainage system. Water enters this well from the drainage system, which is subsequently pumped out with a pump into the drainage channel. To accommodate such structures, large areas of more than 30 square meters are needed. meters The productivity of underground filtration fields largely depends on the composition of the soil: the best option is sand, the worst is clay. Purified water enters the aquifer or is collected in drainage ditches or wells. The service life of the fields before silting is approximately 10 years, after which the sand-gravel pad must be replaced. Does not require maintenance for a long period. Significant areas are required for mounting the filtration field. The level of water purification from pollution in such systems is not high enough to use it even for irrigation or household needs. After about 10 years, the filtration system becomes silted and its reconstruction is necessary, which is an expensive and time-consuming process. In which case you can use. 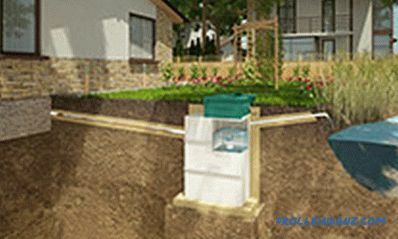 The use of septic tanks with filtration fields is possible only on large land plots. High performance of such facilities allows their use in houses with a large number of tenants. On the sites under which the filtration fields are located, it is possible to break up flowerbeds and lawns, the planting of cultivated plants, trees and shrubs is prohibited. The accumulation of harmful substances in the fruits of cultivated plants can lead to an outbreak of gastrointestinal diseases. The infiltrator is a substitute for drainage pipes, and its main advantage is a much smaller area compared to the filtration field. The infiltrator is a long plastic tank that resembles a trough. Only it is installed bottom to top and has an inlet and outlet. 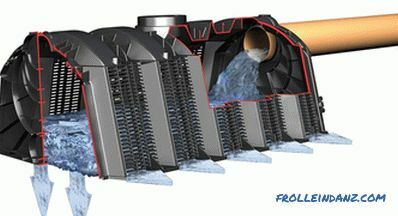 The 400-liter infiltrator can replace about 35 meters of filtration field pipes. A septic tank with an infiltrator. 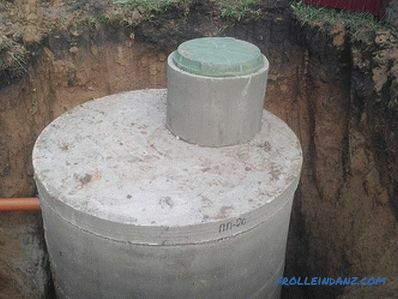 There are two types of septic tanks with infiltrators: with an intermediate well located between the septic tank and the infiltrator and without it. 1. Septic; 2. Pipe; 3. Cushion pillow; 4. Infiltrator; 5. Ventilation. 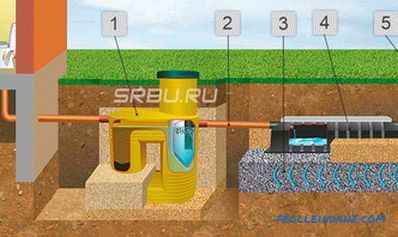 A septic tank with an infiltrator and an intermediate well consists of the same elements, but additional devices are added here, which you can see in the infographic below. The cross section of the infiltration filter. The process of installing infiltrators. 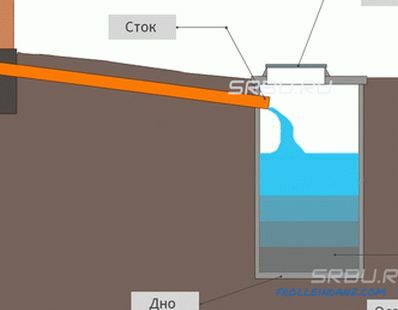 The principle of operation of the septic tank with infiltration. First, consider the principle of operation of an infiltrator without a well. Sewage drains enter the septic tank where they pass through several chambers and undergo a certain cleaning. Further, by gravity through the pipeline, they enter the reservoir of the infiltrator and are absorbed into the rubble. 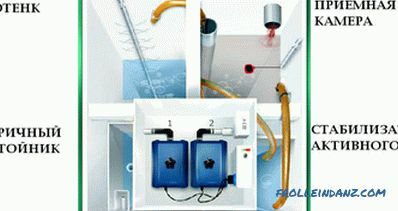 The principle of operation of the infiltrator with an intermediate well. 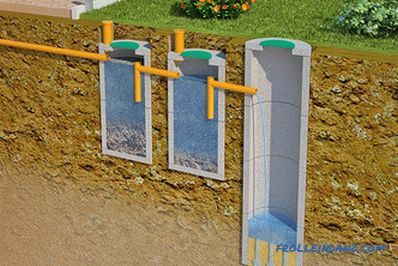 The effluent passes through a septic tank and enters an intermediate well, where a drainage pump with a float is located, which rolls the water back into the infiltrator. Further drains are absorbed into the cushion of rubble. 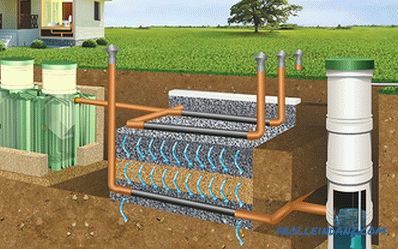 Such a system is used to prevent sewage from getting back into the septic tank. The system is designed for use in areas with a high level of groundwater and poorly absorbed soils. Does not occupy large square. An infiltrator with an intermediate well and a pump can be installed in areas with high groundwater levels. Over time, the infiltrator will have to be cleaned, and a cushion made of rubble replaced, but this will not happen soon. A septic tank with an infiltrator and an intermediate well with a pump is volatile. The level of water treatment is not high enough. The area above the infiltrator can only be used under a lawn. In which case it is worth using a septic tank with an infiltrator. It is advisable to place this system on well-absorbed soils, such as sand, black soil, loam with small clay inclusions and low water table. Constructions of this type are capable of absorbing a large amount of effluent including salvo zabros when a large amount of water enters the septic tank at once. 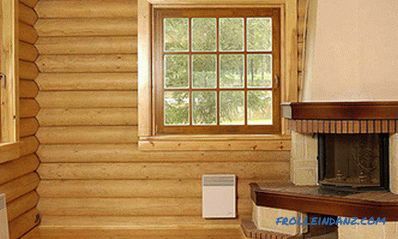 It is possible to use in homes with a large number of residents. In which case it is necessary to use a septic tank with an infiltrator and an intermediate well. It is advisable to use the system with an intermediate well and a pump in areas with high groundwater levels. The use of an intermediate well with a pump and a check valve prevents the return of sewage into the septic tank, in the event that the effluent infiltrator will be absorbed very slowly. The high level of groundwater and the limited land area does not allow the use of traditional methods of water purification. In such conditions and in order to protect the environment, the use of factory-made biological treatment systems is recommended. There are several varieties of such structures on the market that can provide almost complete purification of water from pollution. 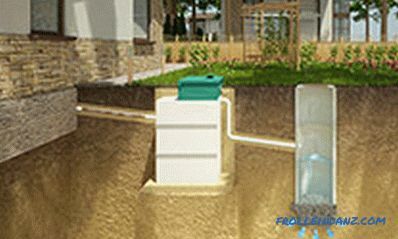 Septic tank device with biofilter. 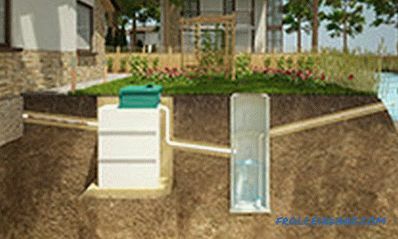 Septic tanks with biofilters are used in private households and organizations. 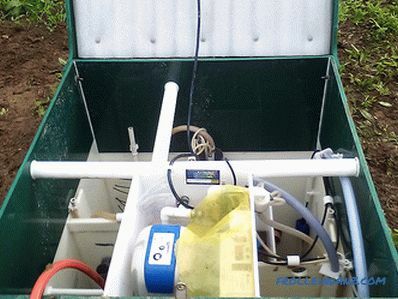 In general, the device consists of a septic compartment and a compartment with a biofilter. In the compartment with the biofilter there is a backfill of a certain material not subject to rotting: expanded clay, polystyrene foam, synthetic fibers. During the operation of the septic tank, a biofilm consisting of numerous colonies of bacteria is formed on the surface of the backfill. Now we will consider from what constituent elements various septic tanks with biofilters consist. 1. Membrane with holes; 2. Ventilation; 3. Ring number 1; 4. cap; 5. Ring number 2; 6. Biofilter retainer; 7. Housing LOW; 8. 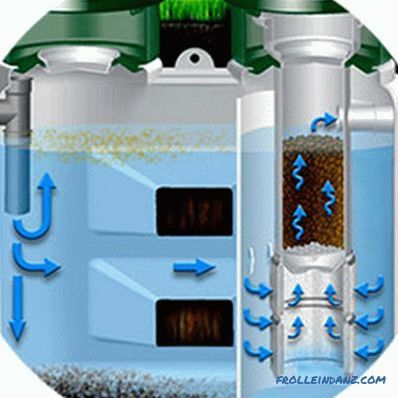 Bio filter with loading; 9. Flat filter. 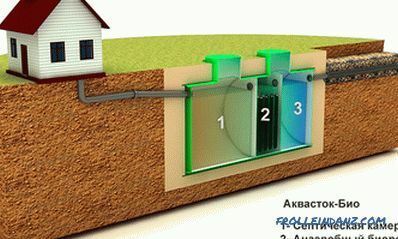 Principle of operation septic tank with biofilter. The effluent through the inlet manifold enters the first compartment of the septic tank, which performs the function of a sump. Here there is a sedimentation of solid particles and the separation of fats with their subsequent ascent. The wall between the compartments is a membrane with a multitude of calibrated holes through which conditionally clarified water overflows into the second chamber. Here the liquid passes through a coarse filter, where solid particles are removed. For these purposes, use a special fabric or other materials. The last stage of water purification occurs in a chamber with anaerobic bacteria, which destroy organic compounds in the process of their vital activity. After that, the filtrate enters the cumulative capacity and can be used for technical needs. Water discharge to the ground or to the drainage ditch is allowed, the level of residual pollution is not sufficient to have a significant impact on the environment. Good degree of cleaning water - 85 - 95%. Do not require frequent maintenance, it is enough to pour drugs containing bacteria into the toilet once a month. Electricity is not required to operate the system. Does not emit unpleasant odors. Installation is quite simple and does not take much time. 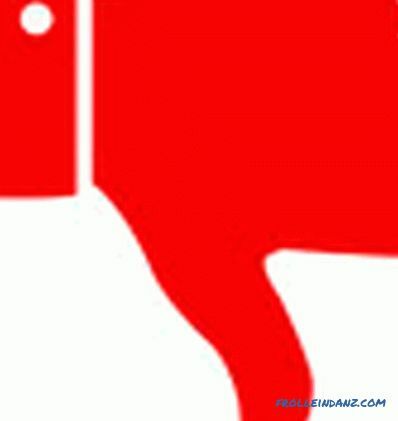 We will not allow a long simple system (2-3 weeks), in consequence of which the death of bacteria can occur. Bacteria do not tolerate bleach and many chemical detergents used in everyday life. There is a need to add biologics. The cost of the system is more expensive than a normal septic tank. In which case you should choose a septic tank with a biofilter. A bio-cleaned septic tank can be used in individual houses that are used for permanent residence. Such structures do not require frequent maintenance and are easy to handle, so the introduction of cultures of microorganisms can be carried out through the toilet. The main disadvantage is the possible death of anaerobic bacteria during long-term autonomous sewage. The cycle from the moment of introduction of new crops to the achievement of maximum efficiency reaches 14-15 days. 1. Release; 2. Tertiary septic tank; 3. Aerotenk of the first stage; 4. Secondary settling tank; 5. Aerotenk second stage; 6. Tank-grease trap for collecting sludge, sand, grease; 7. Log drains. Deep cleaning system with an open hatch. The installation process of the deep sewage treatment system. 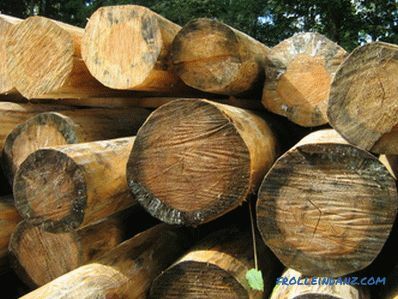 Through an absorbing well, it is used on soils with good clotting. To the relief in a ditch. 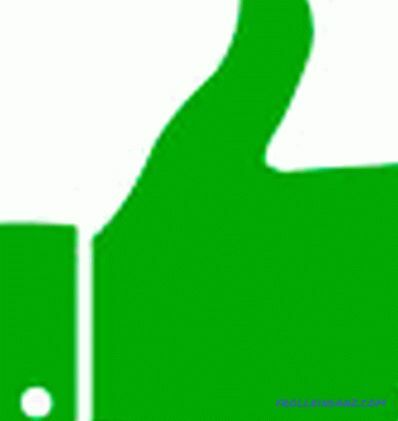 To the relief, through a distribution well, for using purified water. 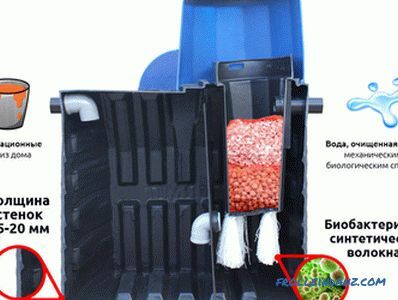 The principle of operation of the deep bio-cleaning station. The effluent enters the settling tank, in which the process of separating fat takes place using a special device and the sedimentation of insoluble particles with the formation of sludge. Next, the filtrate is mixed with activated sludge consisting of algae and aerobic microorganisms. To intensify the processes of their vital activity, the compartment is aerated with external air, which is pumped by an electric pump. Sludge settling occurs in the last compartment, which is subsequently pumped into the aeration tank for reuse and creating a closed loop. Water purified to the level of 98-99% is drained into drainage or used for household needs. Water passes enough deep cleaning, which is 98 - 99% and can be used for technical needs. The settings are quite compact. Do not emit unpleasant odors. Installed on any areas regardless of the level of soil in and type of soil. Consumables in the form of various biologics are not required. The system is quite durable and designed for operation for decades. For the operation of the system requires a constant supply of air, and hence a constant supply of electricity to the installation. Without air supply, aerobic bacteria begin to die. Systems of this type are quite expensive. The prolonged absence of runoff leads to the death of bacteria and microorganisms that make up the activated sludge. Over time, a significant amount of sludge accumulates and must be removed, this procedure is carried out 2 times a year. In which case it is worth using. The main advantage of a septic tank with forced air supply is high efficiency and degree of water purification. Such equipment has no restrictions on use, is optimal for homes with a large number of tenants and practically does not require maintenance. It can be installed on any soil regardless of the groundwater level. 1. Purpose of the building: for permanent or temporary residence. Some types of cleaning equipment do not allow long downtimes. 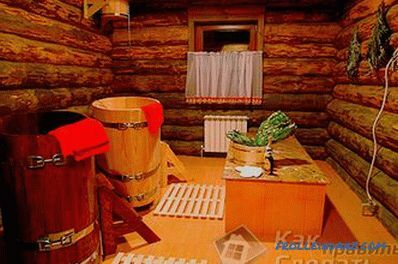 For summer houses and small houses suitable cesspool cumulative type of estimated volume. 2. The size and geology of the land, as well as the composition of the soil and groundwater level. 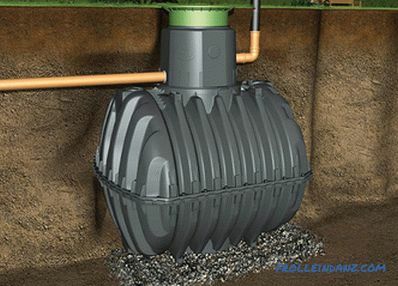 It is impossible to use septic tanks with underground filtration fields on small sites. It is not allowed to use septic tanks with a filtration well with a high level of groundwater. 3. Daily volume of effluent and salvo discharge. Calculated based on the number of permanent residents in the house and the number of guests who regularly visit the hosts. Knowledge of this indicator is necessary to determine the performance of a septic tank, which is indicated in the technical documentation. High-tech equipment, taking into account the cost of installation and maintenance will be quite expensive. To reduce costs, the construction of one- or two-chamber septic tanks from materials available and without the involvement of specialists is recommended. To determine which autonomous sewage system should be chosen for a private house, consider all the above factors and, if necessary, consult and bring to business specialists. Mistakes made in the design and installation of autonomous sewage systems can cause extremely negative consequences.